The Don gives Coach Gase the "blessing"
Post subject: The Don gives Coach Gase the "blessing"
You're not really the head coach of the Miami Dolphins unless the Don blesses you. 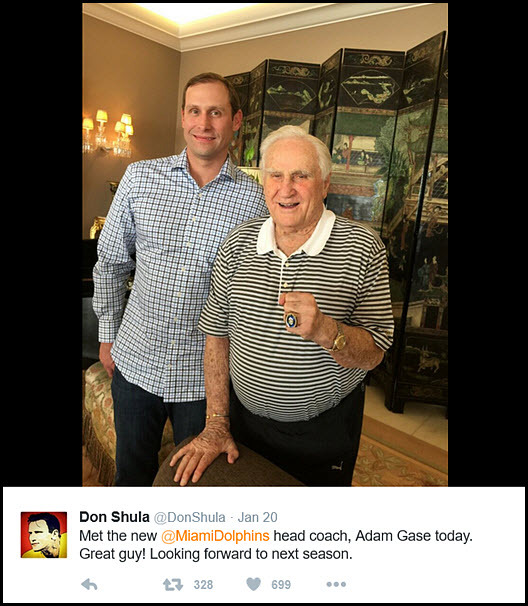 And new coach Adam Gase has that blessing, having met with former coach Don Shula at the Hall of Famer's Indian Creek Home this week. "That was great," Shula told The Miami Herald Friday. "I like him. He's an impressive young guy. I enjoyed meeting and talking to him." "It was an unbelievable experience," Gase said Friday. "That is when it really hit me that I was the head coach of the Miami Dolphins, sitting there with coach Shula. He gave me very simple advice -- do it your way from the start. That's something that he did as a coach and he had a lot of success with. I was very appreciative to spend the afternoon with him." Gase and Shula spent a couple of hours talking about life, South Florida living, and Dolphins football. And, yes, the winningest coach in NFL history with 347 wins says he shared some other advice that Gase, who has a 0-0 career head coaching record, can use. Post subject: Re: The Don gives Coach Gase the "blessing"
Shula is always impressed with our coaches. He said he was impressed with Cam Cameron. He signed off on Philbin and Saban. About the only guy he didn't sign off on was Jimmy. I think he's like the rest of us ... hoping for the best. I think Don Shula and Jimmy Johnson's problems started when JJ fired his son as his offensive coordinator. Then JJ's mouth and actions did the rest.